Finland's most promising heralds of doom and death metal, Swallow the Sun, are back with their fourth full length album, New Moon. Lead guitarist Juha Raivio describes the new work: 'This is the most progressive, sorrowful, beautiful and evil sounding album we have done so far. This time around, you can never be sure where the songs are going to take you. The depths of hell and heaven are carved deep into these songs.' Don't you love the way metal dudes talk with equal amounts of poetic conundrum and contrast. Nevertheless, Raivo description pretty much nails the character of New Moon. The music is intriguing and expansive, enough to turn notions of conventional death or doom metal on its proverbial head. These Wood Breath Evil, Sleepless Swans, and mysterious and creepy Weight of the Dead turn more on somber and sorrowful melody than upon the plodding mire of doom (though it is present). Aleksi Munter's keyboards are fluid, tangible, and spooky throughout. On the death metal side, Mikko Kotamaki works his way through with the typical demonic growling and/or screaming. However, it's a shame to hear this as Kotamaki, when singing normally, is brilliant and compelling. 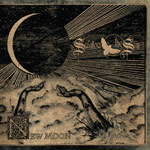 Vocals withstanding, musically speaking New Moon is a terrific work, and fans of melodic death and doom metal should love it. Swallow the Sun's fourth work New Moon is epic and compelling melodic death and doom metal, possibly their best album to date. However, it's weakened by the incessant growling and screaming vocals of Kotamaki who, when singing normally, has a compelling vocal style.